A Congolese woman gave birth Thursday on board of a Turkish Airlines (THY) plane heading to Istanbul from the Gabonese capital Libreville via Kinshasa. Musuamba Michoukayembe, 21, a citizen of the Democratic Republic of the Congo, started experiencing labor pains nearly three hours after takeoff at roughly 13,000 meters (42,650 feet) above ground in Niger's airspace. As labor was approaching, her husband — a doctor — and the cabin crew immediately began preparations. The area at the back of the plane was "isolated" for the delivery. The mother and her newborn son — both in good condition — were taken to a hospital after the plane landed in Istanbul. The new parents named their baby boy Bennel. "Under the leadership of our flight purser, the cabin crew established the necessary coordination and the baby was born after a healthy delivery. Fortunately, his father was a doctor, he helped us a lot," pilot in command Alper Akkaya said. According to Akkaya, shortly before entering Turkey's airspace the crew requested a priority landing as well as an ambulance and doctors. "We completed this beautiful event in a healthy way. If it had not been a healthy birth, we would have diverted to another airport. But since it was healthy, we continued our four-hour flight," he added. When the plane touched down in Istanbul, the new parents and the baby were taken to the nearest hospital in Yeşilköy. Speaking of the excitement the crew experienced during the childbirth, purser Fatma Akyüz said they "boarded with 144 passengers, but landed with 145 passengers." "It was a beautiful moment for us," she added. 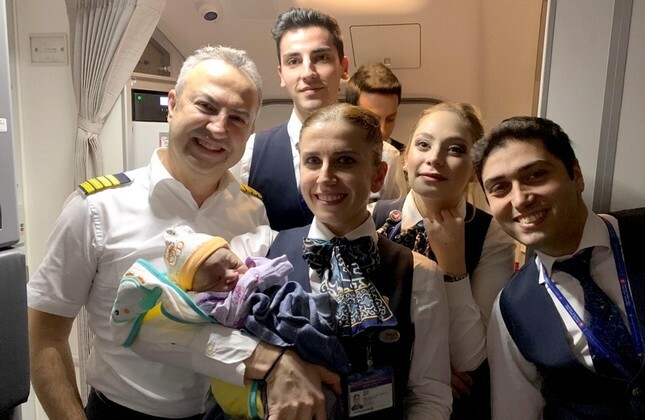 Cabin crew member Ilayda Erhalaç said the young mother was quiet and relaxed after takeoff but three hours later, she went into labor. "We prepared for the birth of our newest friend in a matter of minutes. We dealt with it professionally and everything turned out well," she said. This was the sixth birth recorded in the past 28 years in Turkish airspace or a plane registered in Turkey. In April last year, Diaby Nafi, a Guinean-French woman who was traveling on a Turkish Airlines flight from Conakry to Istanbul, also gave birth on board to a healthy girl named Kadiju. Now-28-year-old Erkan Geldi has a unique title as the only employee of an airline who was born on the same airline's flight. Erkan's mother Fatma Geldi gave birth to his son on Sept. 9, 1990, as she was traveling with a Boeing 727 from Izmir to Frankfurt on her way to see her husband Kemal Geldi. The front part of the plane was cleared out for the birth, which was also assisted by a newly-graduated gynecologist. The family decided to name their son after the plane's First Pilot Erkan Süzer. Geldi is now working as a flight attendant for THY.